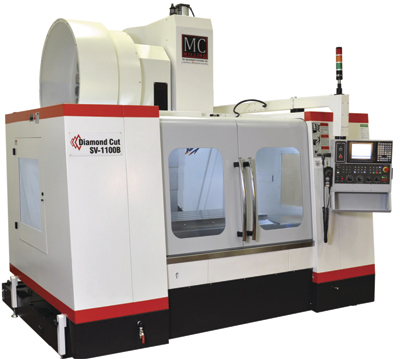 MC Machinery Systems, Inc., Wood Dale, IL, introduces its Diamond Cut lineup of milling machines, comprising five series of vertical machining centers and drilling and tapping machines. Included is the MCV Series of general-purpose vertical milling machines, which offer the choice of two spindle/tooling systems—a CAT-40 tooling system with an 8000-RPM motor, or a CAT-50 tooling system using a 6000-RPM motor. Use the machines on fixtures and dies and to perform secondary operations. The machines feature coolant-thru-spindle preparation and an M70 Mitsubishi controller; as an option, add a ZF gearbox to achieve four times the torque of a standard motor. Also new are the SV Series machines, featuring heavy-duty box construction in the X, Y and Z axes to add rigidity and stability for machining of large parts. The machines feature a 10,000-RPM spindle, CAT 50 tooling and hand-scraped box guides. For drilling and tapping, consider the TV Series machines that feature a 24,000-RPM high-speed spindle driven by a 5-HP motor. Dual-contact tooling delivers extra rigidity and optimum Z-depth control.